ZYLKENE Equine is a natural product, derived from the milk protein casein, which has been developed to help horses and ponies overcome difficult or stressful situations. ZYLKENE is a complementary feed for horses and ponies that contains a natural product, derived from casein, a protein in milk. This molecule is well known to promote the relaxation of newborns after nursing. ZYLKENE Equine can help support horses and ponies in situations where they feel they to adapt their behaviour to cope (spooking, weaving, crib-biting etc.). Horses, like humans, experience apprehension and stress in certain situations. Some degree of stress is normal, however if stress becomes excessive it can lead to behavioural problems. In the wild, horses live out in the open, grazing throughout the day and are part of a herd with a structured hierarchy. Modern day conditions for horses are usually far removed from this way of life and can be difficult to adapt to.. It is ideal to use for support for chronic behavioural problems in consultation with your veterinary surgeon's advice, or given before the event of predictable stress, such as travelling, dentistry, or a change of environment. If your horse usually requires sedation by your veterinary surgeon, do not use Zylkene as a substitute - seek advice from your vet. Because ZYLKENE is a non-sedative, milk-derived foodstuff, it has not been associated with any side effects and can be used for prolonged periods safely without the risk of sedation. 20 sachets each containing 4g Zylkene powder. Each sachet contains 1000 mg of Alpha-S1 Tryptic Casein in an apple flavoured powder. 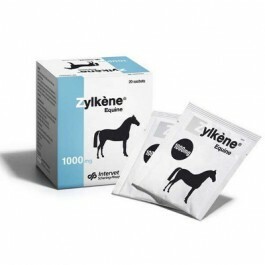 Zylkène Equine is an apple flavoured, easy to give powder. Mix the contents of one sachet into your horse’s feed once a day (horses under 500kg). Horses over 500 kg bodyweight will require two sachets given once daily. For anticipated stress such as travelling, teeth rasping or a change in environment, start Zylkène Equine from 2 days prior to, and for the duration of, the stressful event. If your horse requires injectable sedatives administered by your veterinary surgeon, Zylkène Equine is not a suitable alternative. For chronic behavioural problems Zylkène Equine can be used on a continuous basis. Your horse’s behaviour should be re-evaluated after a 20 day course and, in consultation with your veterinary surgeon, the daily intake can be modified if required. How do horses react to stress? Most horses will react instinctively in the face of perceived danger to escape or flee from the threat and protect themselves. If they are unable to get away they might respond with aggression. Horses that are stressed over a prolonged period of time can develop behavioural problems such as box walking, weaving or a change in temperament. If you think your horse may be showing signs of stress, first contact your veterinary surgeon who will be able to tell you if there is a medical reason for the behaviour. Your vet will also be able to discuss management options with you which may include training or environmental changes.